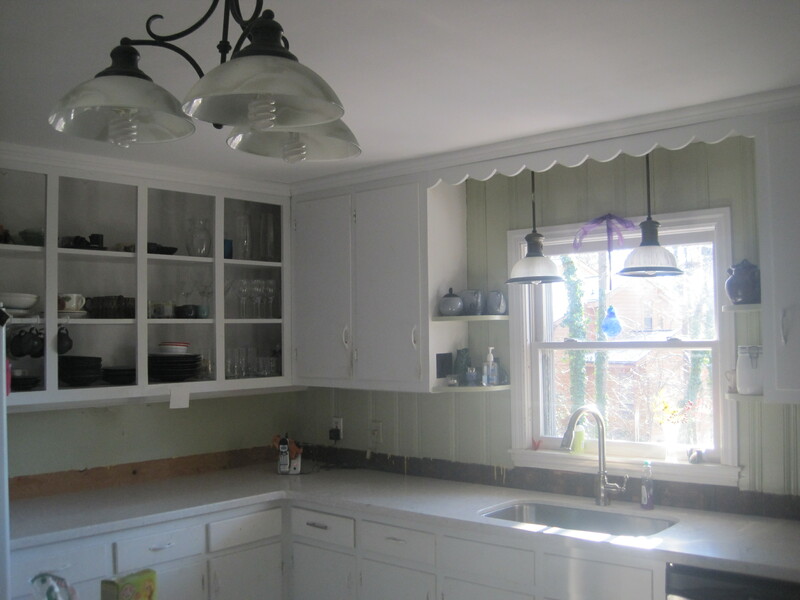 See that scalloped wooden valance? I tried to love it. I tried to appreciate it for its vintage character. But in the end, I took a hammer to it. Technically, Mark took a hammer to it, but I placed it in his hand. That scalloped wooden piece didn’t go down without a fight though. 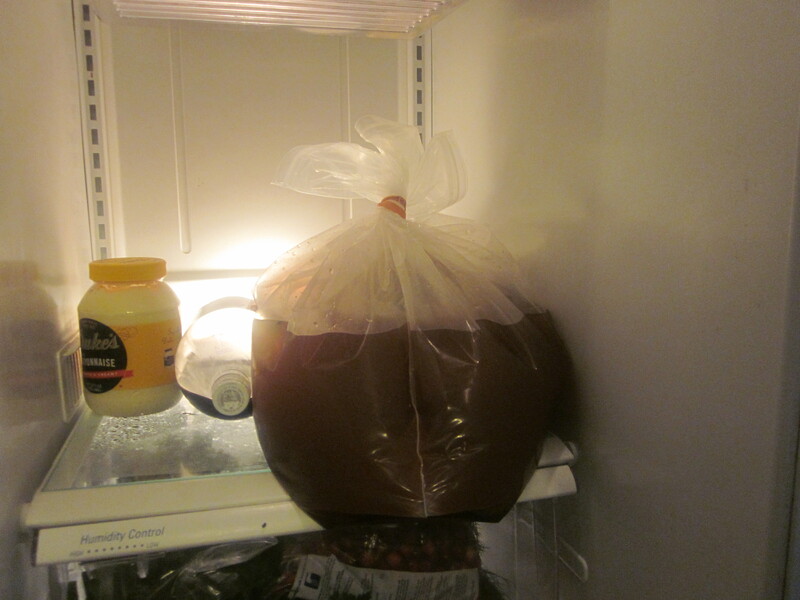 It took a lot of effort (from Mark) to loosen it and bring it down. Let’s look a little closer. 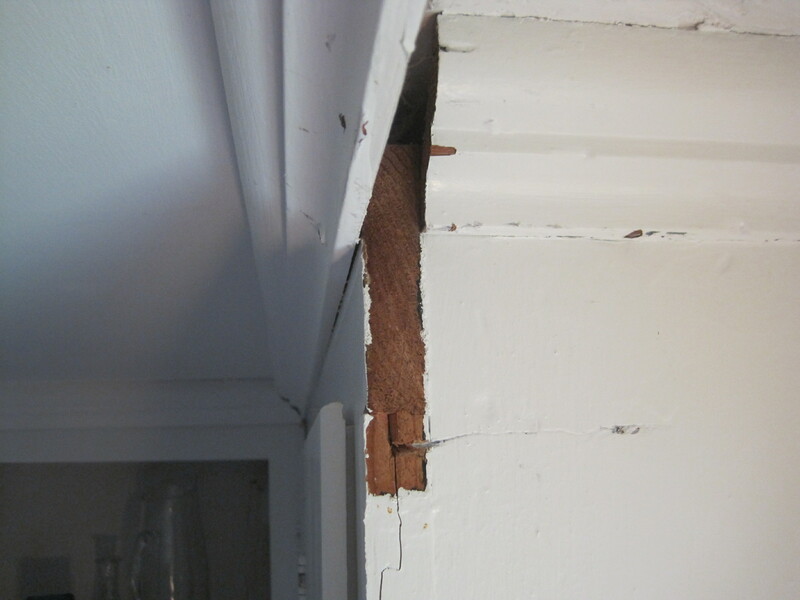 Uh oh, that’s a big piece of split wood on the front of the adjacent cabinet. 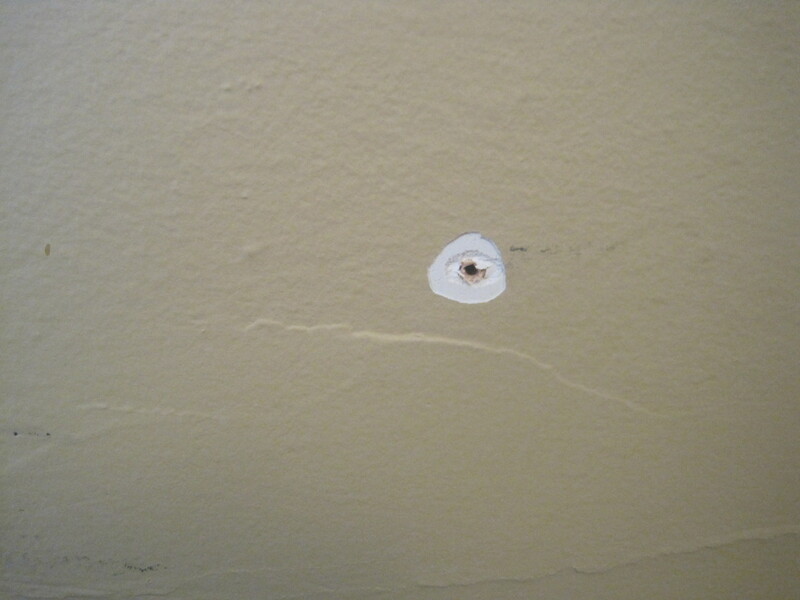 I think we’ll be able to fix it with some wood glue and filler. 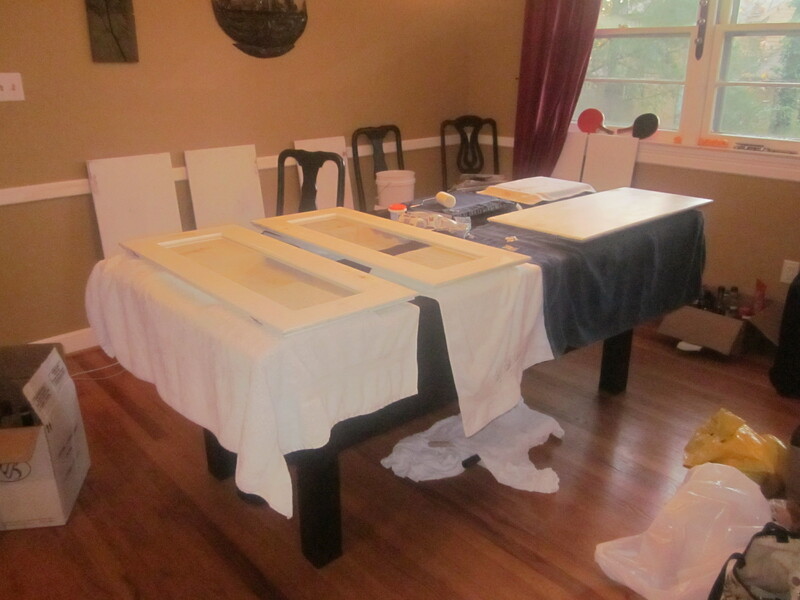 And, of course, we’re planning on painting the cabinetry anyhow. You can see more split wood on the other side. 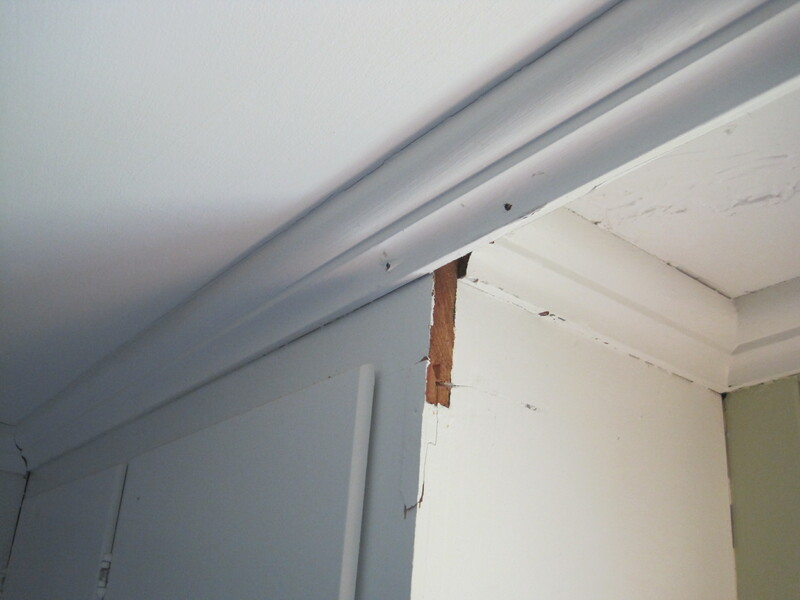 We’ll have to figure out what to do with that inch long space that’s left between the two pieces of molding. 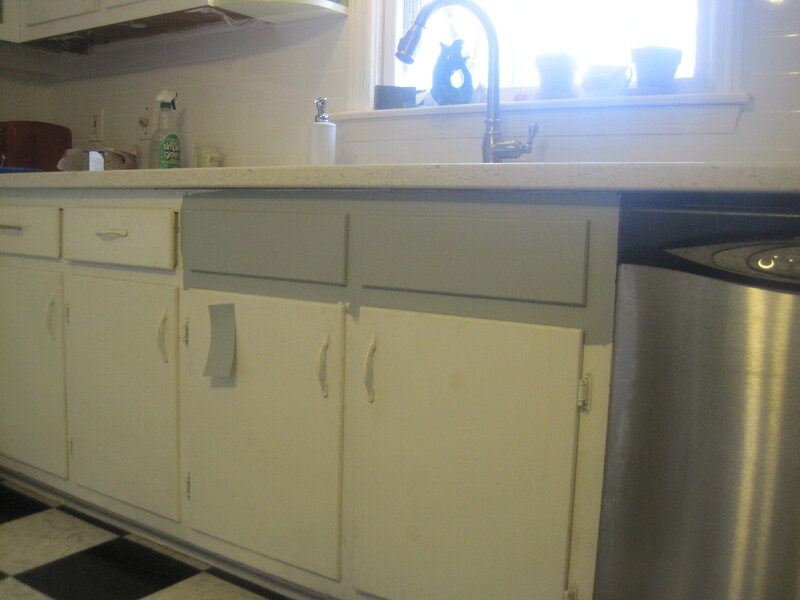 But despite these problems that arose with taking down the wood valence, and despite my efforts to love my vintage kitchen, I’m so glad the scalloped beast is gone. It’s time to paint the kitchen cabinets. We bought a new countertop and backsplash, both of which look great. 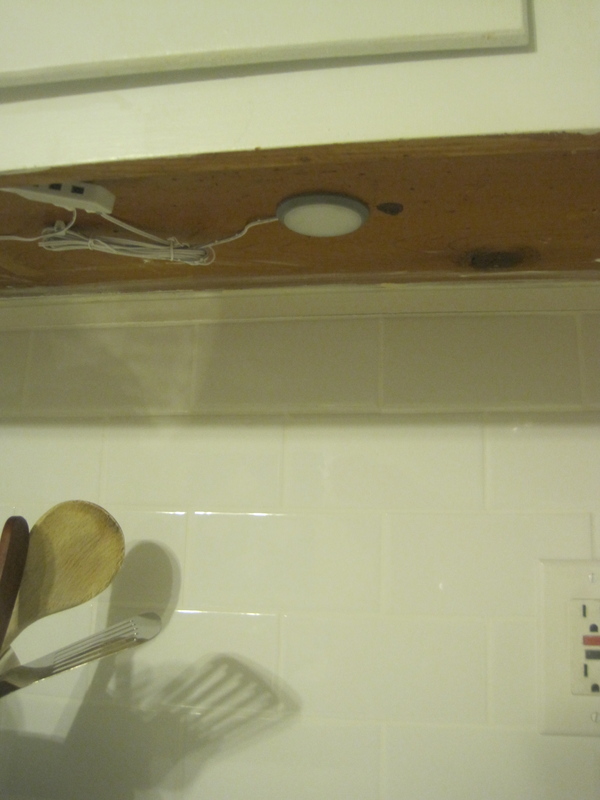 We also installed new under cabinet lights, but I’m not so happy with those. Now we’re talking paint colors. 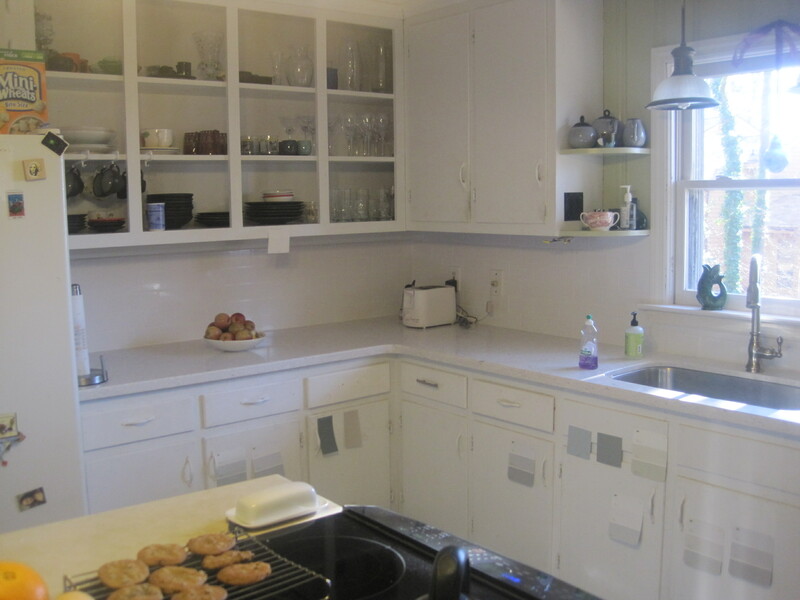 Here’s a photo of our very white kitchen. 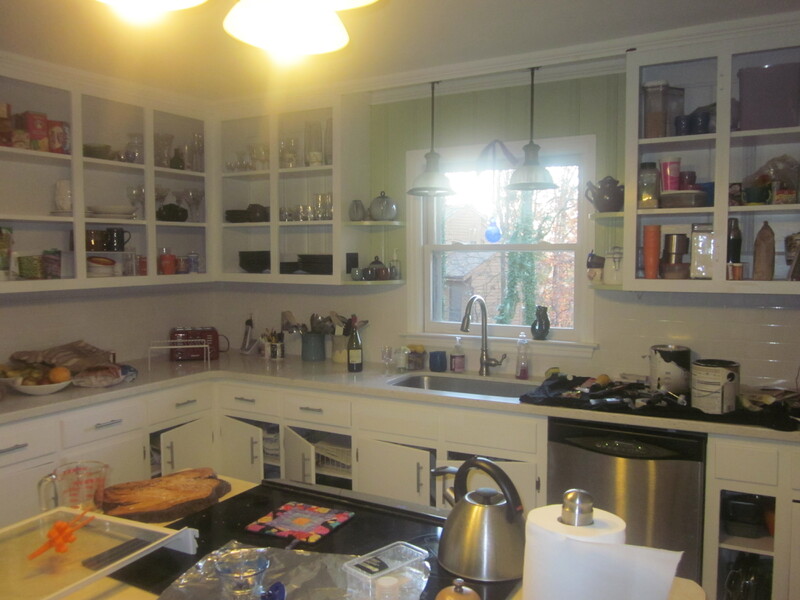 I happen to love white kitchens and would be happy repainting the cabinets white, but Mark is really keen on adding color. 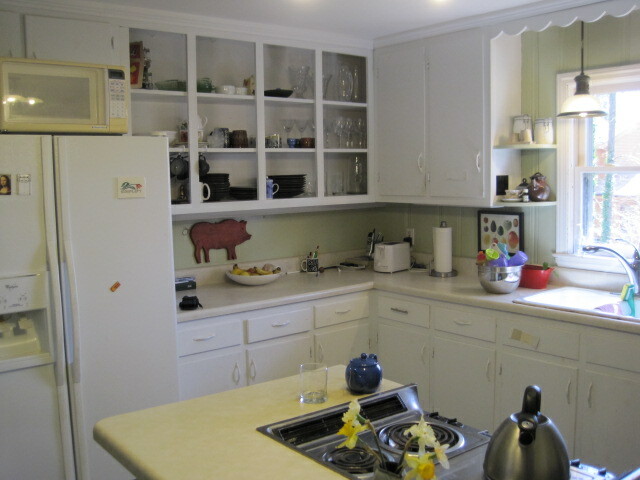 So we decided to compromise: we’d repaint the upper cabinets white and the lower cabinets some other color. Inspired by photos of these gray cabinets I found here, I tried to sell Mark on the idea of gray cabinets. His response to the photos: “very pretty, but cold and institutional.” Hmm. After much discussion, we settled on searching for a blue-gray color which would add some color but still be fairly neutral, go with the countertops, and feel warm and inviting. That’s when we brought home every blue-gray paint swatch known to man and started taping them on our cabinets (you can see just a few of them of them in the photo above). Over and over our eyes was drawn to “Winter’s Day” by Martha Stewart. 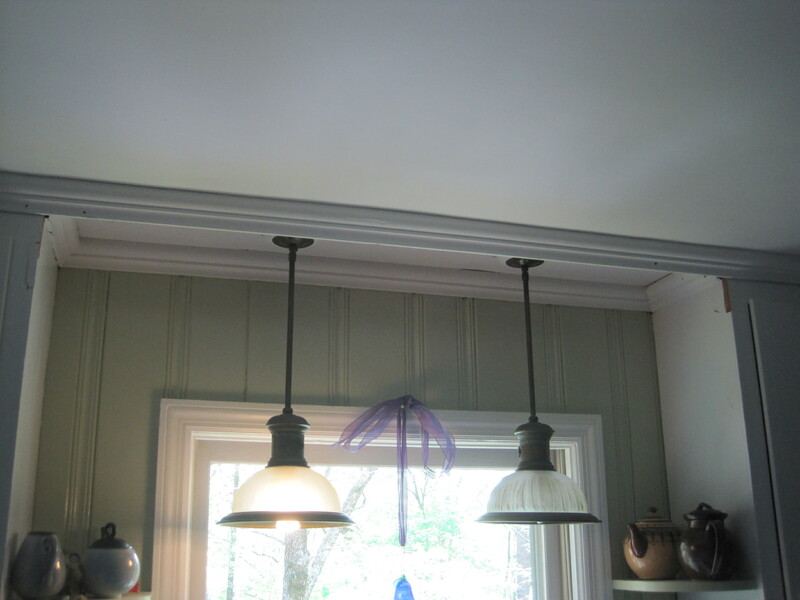 Not wanting to repeat the mistakes I made searching for a porch ceiling color (which you can read about here and here), I tried to do some research on “Winter’s Day,” googling to see if I could find photos of it on other people’s cabinets. No luck. So we made a $3 investment and bought a test can which I used to paint a portion of the bottom cabinets. Pardon the less-than-stellar photos. I’m not a great photographer on my best day, but I really don’t know how to take photos when dealing with light from a window. Sadly, we don’t love Winter’s Day. We like it, but we’re going for love here, not simple affection. 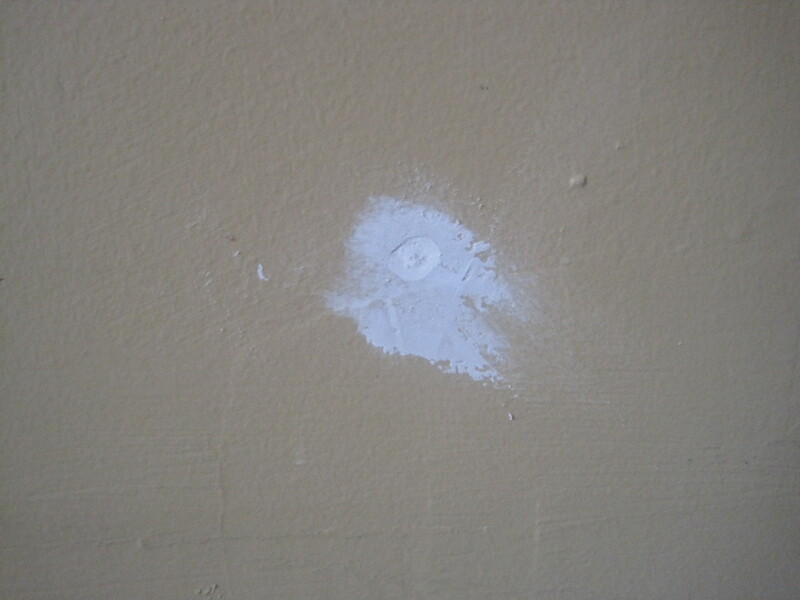 So it looks like we’re back to the negotiation phase of searching for a paint color. Yeah, thank God we’re picking a new color. While I like the fact that the LED puck lights are basically invisible unless you’re underneath the cabinets looking at them, I’m nonetheless quite disappointed in these lights. Compared to the fluorescent lights, they are very dim. Mark calls them “good mood lighting,” but the only thing I’m in the mood to do in the kitchen is cook, and as task lighting for food preparation they’re terrible. Also, the LED light is blue which, although I’d read about the blueness of the lights in various critiques before I’d bought the lights, I sort of thought the blue wouldn’t bother me (actually, I’m pretty sure what I thought was, “How blue can they be?” Answer: blue enough to be noticeably annoying). Granted, in the photo above I used a flash which inexplicably makes the LED lights appear extra blue, but still, they’re blue. And that’s weird, right? In addition to the $70 I spent on the lights, I spent $80 to have them installed (I never attempt DIY electrical; I think it’s important to know my own limitations). While I wouldn’t go so far as to say these lights were a $150 mistake, I sure do miss my fluorescents. I’m here to chronicle more of the fall. Is that a high-pitched scream I hear? 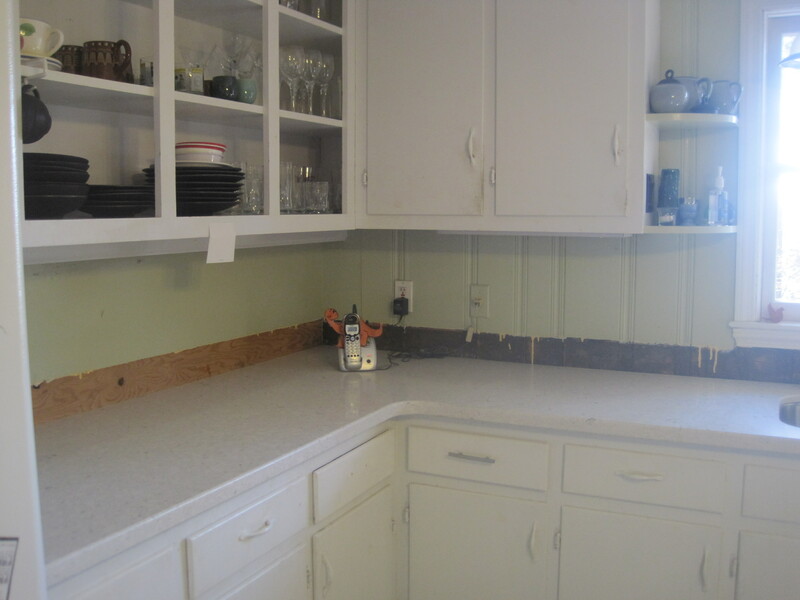 Anyhow, those fancy new countertops left behind a pretty darn ugly brown strip covered in dried glue. 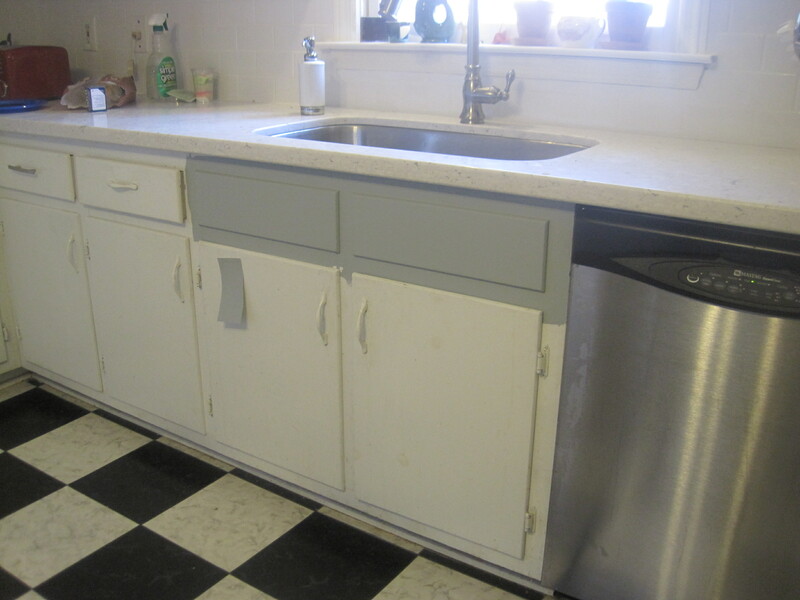 The old counters had a 6″ backsplash but I really didn’t want the same thing with the new countertops. 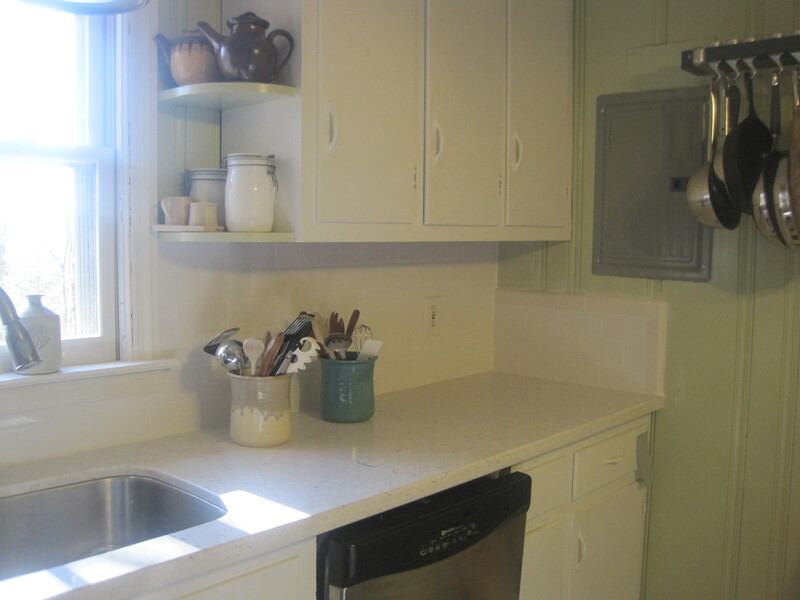 I wanted a proper backsplash that would go from the counters all the way up to the base of the cabinets. 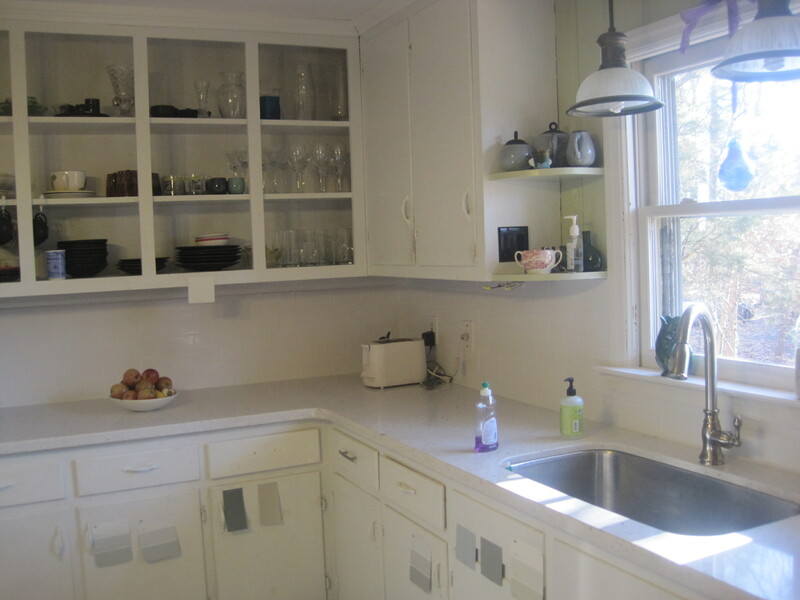 The walls of our kitchen are almost entirely knotty pine wood paneling (that has long been painted). You know what I’m talking about, right? The paneling that you’re just about guaranteed to come face to face with when you enter a ranch house from the 1950s or ’60s (and maybe even the ’70s). While I really hated the paneling when we first moved in, I’ve not only come to tolerate it, I actually sort of like it now. I think that’s because I really love the look of beadboard in older homes and if I squint, I can kind of convince myself that the painted paneling is beadboard. 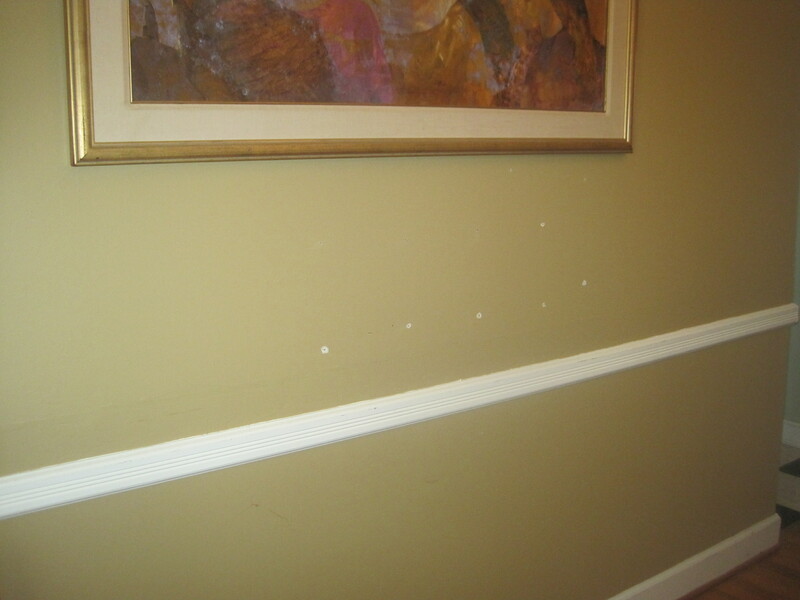 What I don’t love, however, is that the wall behind our countertops is wood paneling. I just couldn’t love the look no matter how hard I squinted. 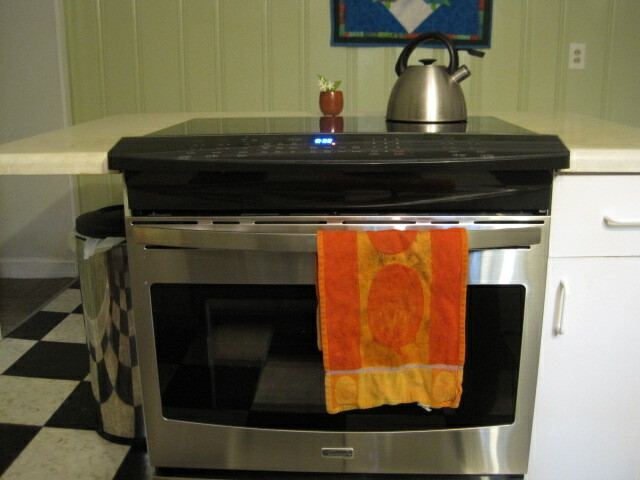 So after the countertops were installed, Mark and I pretty quickly decided that the next upgrade would be a backsplash. Tile directly over the wood paneling. Cut out the wood paneling and install backer board in its place. Put backer board over the wood paneling and tile over that. The problem with the paneling, according to some, is that wood tends to contract and expand depending on temperature and humidity. 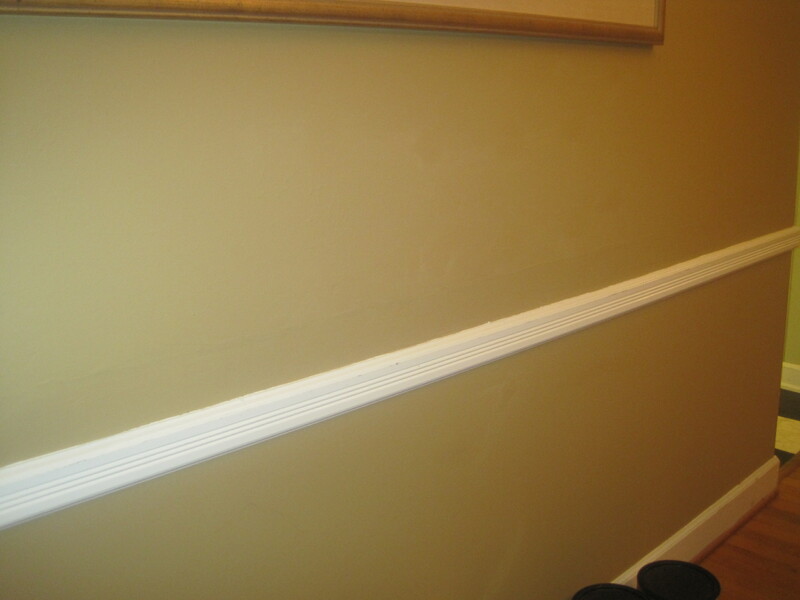 Thus, if you tile over wood paneling, the contracting and expanding might crack the tile (or the grout around the tile). So we hired a tile guy to come do the backsplash. 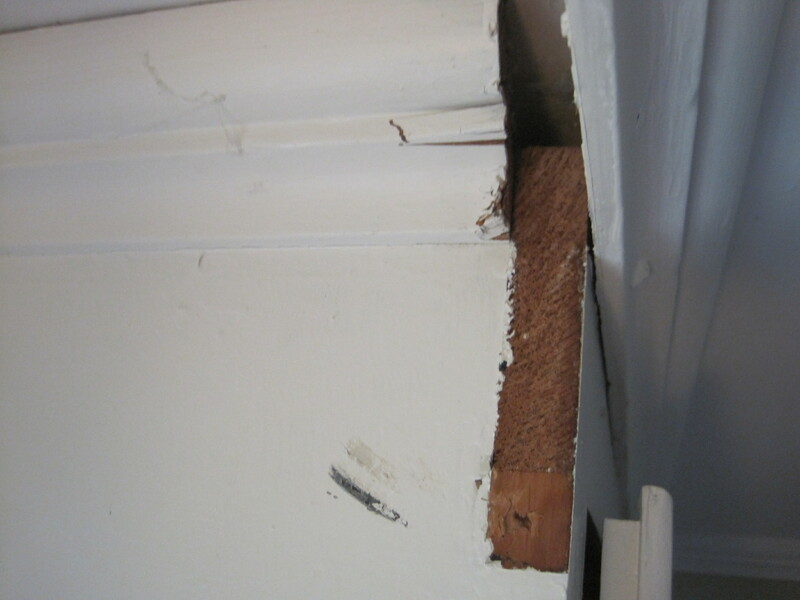 He decided to install backer board over the wood paneling. He took two days to do the backsplash. The first day he installed the backer board. 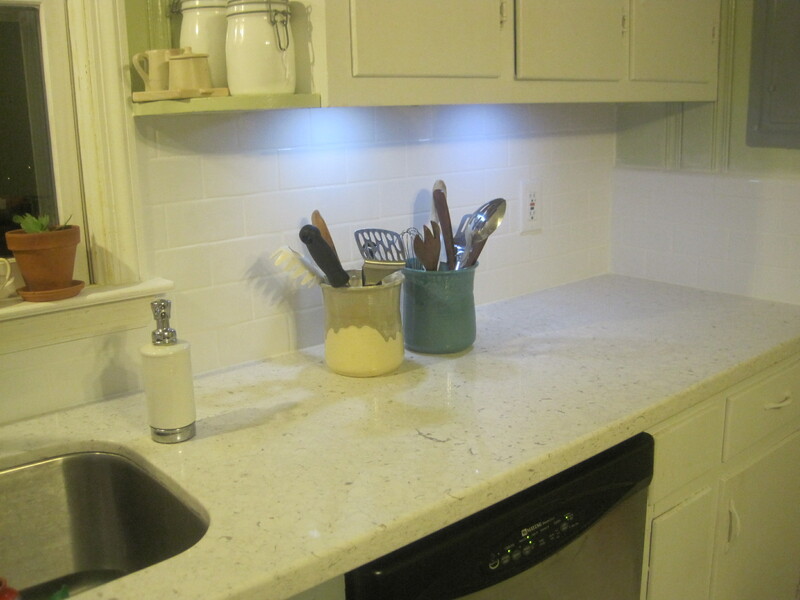 That’s 3″ x 6″ white subway tile, otherwise known as perhaps the most ubiquitous backsplash choice. Don’t get me wrong, I absolutely love it, it’s just that we looked at A LOT of options and it seems strange that we ended up with this. 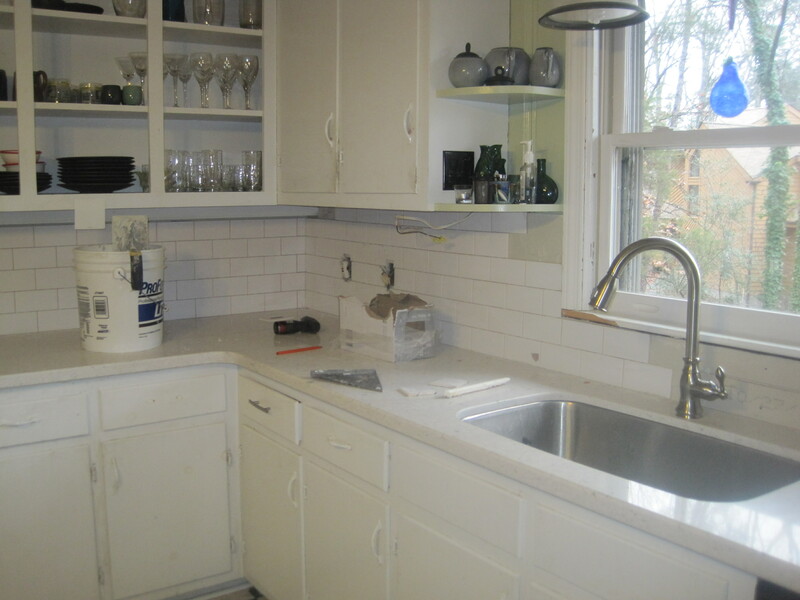 We almost got this really lovely 1″ x 9″ pale green tile that we would have used in addition to the white subway tile, running the green tiles as a single stripe about 2/3 up the backsplash, wrapping all the way around the backsplash. It would have been gorgeous. It also would have cost an additional $200-$300 so we reluctantly ditched that idea. I can’t say I regret it because I really love how the backsplash turned out (and I’ve promised Mark that we’ll add color in other ways). 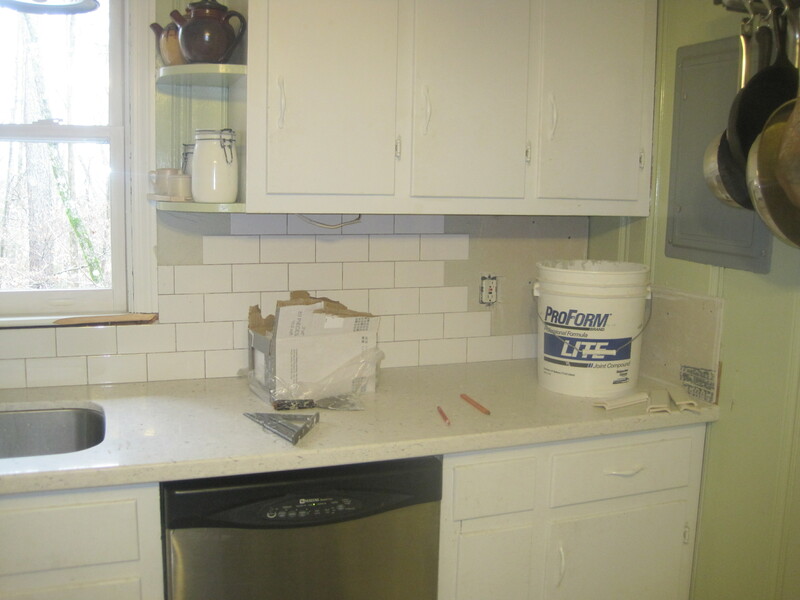 This backsplash cost us $625, and the majority of that was for labor. We could have saved a bunch of money if we’d done this ourselves, but in addition to not knowing how to tile a backsplash, doing it ourselves would have presented other problems: it would have taken us at least twice as long as it did the professional, wouldn’t look as nice, and probably would have caused marital strife. So I have no regrets about hiring out the job. 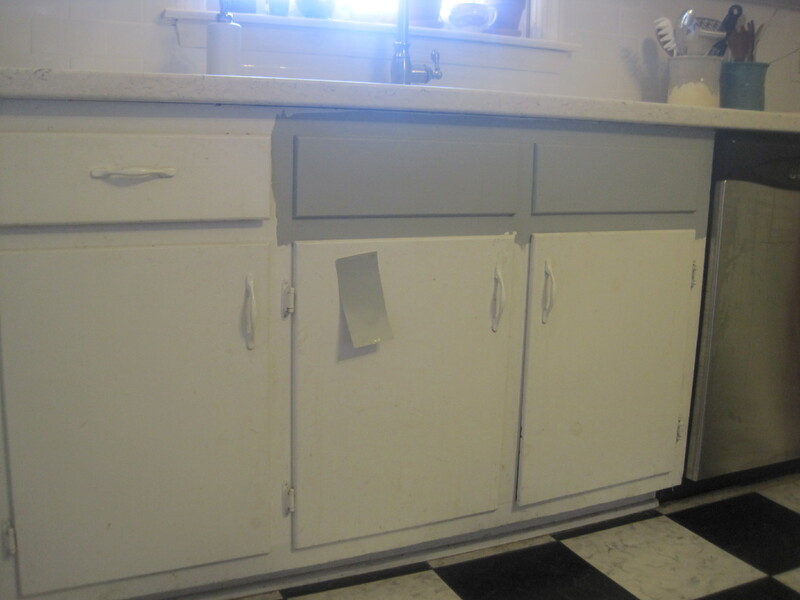 We’ll DIY the next big kitchen project: painting the cabinets. In fact, if you look closely at the backsplash photos above you’ll see all the paint swatches we brought home to try out on the cabinets. And we’re really close to picking one of those colors. Should just take a few more weeks. I’m kidding! We’ve actually already bought one of the colors (there will likely be two colors), so we’re halfway there. Stay tuned. The happy family are enjoying getting to know one another.